This elegant, classic design is beautifully enhanced by the pretty scroll motif and luxurious bindi jewel. The bindi comes in a range of colours to match most of our available ink colours. 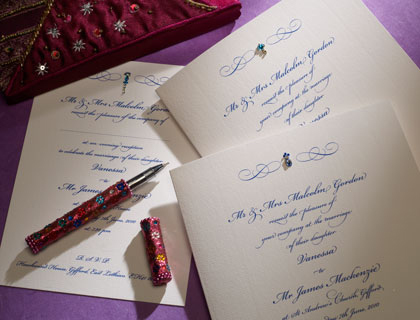 The standard jewel wedding invitation is printed in raised delft blue ink, with bickham typeface, on 8″ x 6″ brilliant white Laid, fly card with bindi jewel. The Invitation includes matching envelopes (unlined). 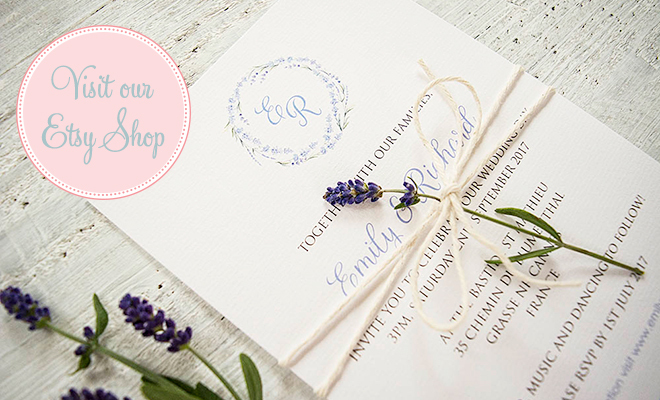 The invitation can be adapted to your preferred style and you have the option to alter size, ink colour, print style and font, add plate sinking or gilt edging. You can add lined envelopes to match your ink and bindi colour for extra elegance.